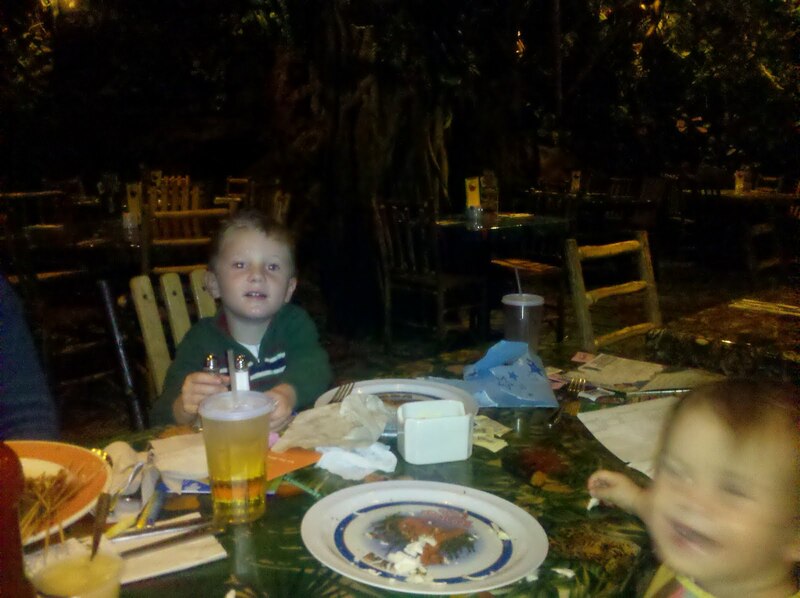 I have often heard from family and even friends how well behaved my kids are for the most part in public. Often I respond by telling them that they are not perfect little angels as they sometimes appear. They are kids and they have their temper tantrums and frustrate me just like any other children. I have been lucky for the most part though because rarely does this bad behavior occur in public. I would like to say that that is because of my great parenting (along with my husband)! Maybe it is and maybe it isn’t but for the first time in the four years since Austen was born we were dealing with our first truly challenging situation. It took four years but I finally got my taste of public embarrassment at the hands of my child. I took Austen to a birthday party last Sunday. Being 4, I looked forward to being pretty hands off and catching up with the other moms while Austen enjoyed the party with his friends. However, five minutes into the party the birthday girl is crying because Austen threw a Leapster game at her head! I was mortified. What shocked me more was that Austen looked concerned but still brushed it off by saying “I said I was sorry!” Of course, I made Austen apologize and sit out for awhile but I had no idea at that moment that I should have taken him home to avoid the later embarrassment he would subject me to. Take two – guitar singer asking the kids (mostly girls) to jump and dance in small space. I saw Austen and his two “boy” friends start to get crazy and bump into each other and knock each other down. I see where this is going and make Austen come sit by me. He mopes around for the next 30 minutes until pizza and cupcakes are served. I think he is back to normal so he goes downstairs to play with his “boy” friends. Some instinct told me that he can’t be trusted by himself down there so I head down too. His friend is complaining Austen isn’t sharing. I tell him to share, he hides in the corner until he sees his friend jumping on the couch (something he is not allowed to do obviously), but he doesn’t give any thought to this now and joins his friend. All the parents of the girls are now downstairs looking at these crazy monkey boys. I grab him off the couch and tell him we are going home and the fireworks erupt – I put him under my arm and take him kicking and screaming to the car. I think the parents who knew him were shocked but most of all I was shocked. My kid doesn’t behave like this and especially not in public. Austen spent the entire rest of the afternoon/evening in his room. And, judging by his behavior this week at school and at home, I think that afternoon in his room and the fact that he didn’t get to go watch the Bears game with his dad and his uncles made an impact on him. I know there will be more instances of public embarrassment in my future but I know there will be even more public moments of pride. This week we went to do annual check ups at the doctor. Austen had his four year old check up and Peyton had her one year (I guess hers are more regular at this age). At any rate, I made both of their appointments on the same day despite last year's experience of Austen totally melting down at the doctor's office. I was wondering what the heck I was thinking but I also like a good challenge. So we drove downtown, parked on the street, got everyone on board the Bugaboo and rolled right over to Northwestern to see the doctor. The first challenge was maneuvering my big stroller into the bathroom and getting a urine sample from Austen. He was completely weirded out by me holding a cup that he could pee into! After some coaxing we finally accomplished that and moved onto the room. Last year, Austen wouldn't even take off his clothes to get weighed or measured. This year he kept telling me he was going first because he was bigger than Peyton. So he did. He weighed in at 38 pounds and is 3 foot 3 1/2 inches. Peyton is 20 pounds, 8 ounces and 31 inches long. Austen interacted well with the doctor following all the instructions and then watching his sister do the same. He had no idea that he was getting two shots that day. The doctor left and while we were waiting for the nurse to come back in, Austen started to catch on a little asking what we were waiting for. The nurse came in and she asked that I hold Austen on my lap. So I put Peyton in the stroller and picked Austen up. She had him look away so he didn't even know that he was getting a shot til he felt a prick and looked back. He didn't cry until he saw the second one and even then he didn't cry for that long. Peyton did well with her four shots too...not crying too long after. They both did a great job at the doctor and are happy and healthy kids. Peyton took a step or two last Wednesday and each day she's taken even more. She's really good at getting up on her own from a seated position and pushing off and standing. Tom and I put her between us and encouraged her to take a few steps. Once she figured she had balance and could stand and then move her feet, she wanted to do it again and again. Freedom! she was probably thinking. She beat Austen...he was 13 1/2 months when he started walking. Of course we noticed too this weekend that the shoes make the difference. She feels more confident walking in her New Balance sneakers than she does in her trendy Uggs...but still pretty exciting stuff! Happy Birthday to my big four year-old! Austen had a full day of birthday festivities. He woke up happy and excited to start his day and opened his presents first. I'm amazed at how excited he gets to open clothes (which we bought him along with a bike helmet) but he does get excited by clothes! Then it was off to school. He brought banana bread muffins for his class to celebrate and they all looked at pictures of Austen "through the years" during his special celebration. Tom and I picked him up early from school and along with Peyton continued his birthday celebration at the Rainforest Cafe. I had not been to one of these restaurants in probably more than 10 years but was impressed with the very life-like animals, waterfalls and juggle atmosphere. Austen and Peyton were mesmerized by the elephants, however, Austen didn't want to get too close! Every 22 minutes they had thunderstorms complete with the sounds and flashing of the lights which fascinated Peyton. Austen told me he did not like the thunder! But he did like the birthday sundae with the candle in it that they brought. All the waiters and waitresses came over to sing happy birthday and Austen was in Heaven. He likes being the center of attention. After Rainforest Cafe, we jumped back in the car and within five minutes, Austen was sound a sleep. Birthdays sure to do take a lot out of you! - I will go to the bathroom and wash my hands by myself (I do at school but at home if my parents help me go to the bathroom I don't have to wash my hands because I don't touch anything!). - I will get dressed by myself. (I am very capable of doing this but I would rather play and horse around most of the time rather than get dressed!). - I will quit being "crazy" (He is working on controlling how excited he gets at home and at school!). Then they made their own individual birthday cakes and sang to Austen. They then made fruit kabobs and fresh squeezed lemonade. After all this work, they finally got to eat! The party was a success, the place was cute and Austen was fast asleep by 6:30 pm. This week holds more birthday fun for Austen...stay tuned! I may have been a little delinquent in posting this holiday season but for good reason. Aside from hosting Xmas dinner at our house, we took off to Mexico for a few days after Xmas. We were there when Peyton turned 1 on Dec. 30. Today, back in the U.S., we celebrated her first birthday with friends and family. It's hard to believe a year has gone by since she came into our world. Right now, she is really starting to show her personality. She wants to be held. She doesn't want to be held. She wants to walk but isn't doing so yet. She wants to talk but instead let's out these high pitch shrieks that has our ears ringing. She likes to raise both her arms when we ask how big is Peyton. She blows kisses and claps her hands. She has recently refused to be fed and proclaims through vigorously shaking her head that she will feed herself which she has begun to do. Bye, bye baby food! She still prefers her beverages from a bottle but likes to also practice drinking from a cup (a Montessori thing - they go right from bottle to cup). She is getting better about napping but you wouldn't have known it on the plane to Mexico where she refused to sleep for the 3 1/2 hour flight even though she woke up at 4:30 a.m. But still we love her because she's so darn cute and because she's ours. Here are a few pics of our little Peyton on her actual birthday in Mexico and then at her party stateside! Loving her cake just like Daddy!